One of the most important issues that must be addressed in a divorce is the economic and emotional support of your children. Courts often use the “best interests of the child” standard when deciding custody. In terms of financial support, many courts rely on established guidelines based upon the household income and earning capacity of each party. Some people mistakenly believe that child support payments are limited to covering basic necessities such as food and shelter. However, the truth is that child support is intended to cover an array of expenses. For example, the cost of your child’s health insurance is part of the calculation. This means the noncustodial parent is responsible for helping pay medical or health insurance coverage or issuing a payment to the custodial parent to cover the cost of insurance for the child, or children. Under Texas law, the noncustodial parent (i.e. the parent who does not have primary custody of the children) will be required to provide child support, in some form. As mentioned, Texas courts generally calculate child support payments based upon parental income. Parents can agree to an amount for child support during divorce settlement negotiations, but courts must ultimately sign off on the agreed amount. It is also important to keep in mind that, if you agree to an amount, it cannot be less than the amount set under the guidelines established by the state legislature. 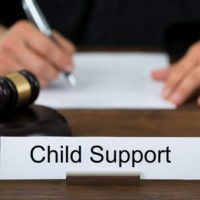 In some cases, the parties may request that the court award a child support amount that is not in accordance with the state’s child support guidelines. This may be necessary if, for example, you have a child with special needs. Your Houston domestic relations lawyer can petition the court to increase the amount of child support based on these unique expenses. Once child support is awarded, the real challenge begins. You need to then work to ensure that the payments are actually sent by the noncustodial parent. For example, among the 6.5 million custodial single parents who were awarded child support in 2013, only 45.6 percent received all of the child support money that was due, according to The Spruce. Fortunately, Texas is taking action to ensure child support payments are made. The office of Texas Lawyer General is generating positive results from an innovative program meant to collect delinquent child support payments. Parents who have been delinquent in making their child support payments in the preceding six-month period are not allowed to renew their vehicle registrations, according to the SE Texas Record. Notice is sent to the delinquent parent 90 days before their vehicle registration is set to expire. This gives the parent an opening to contact the AG’s office and arrange a payment plan in order to renew their registration. In the seven months that the program has been in effect, approximately $1.17 million in delinquent child support has been recovered helping over 4,634 children. As you can see, successfully obtaining a child support amount that will properly cover all of your child’s expenses can get complicated. That is why you should contact Lindamood & Robinson, P.C. in Houston today to schedule a confidential consultation with an experienced child support lawyer. This is a no-pressure, no-obligation discussion intended to give you important information about the divorce process and your legal options.